Almost two years ago, Bing Ads started trialling Custom Audiences. This week the search engine announced that this feature would be made generally available within all Bing Ads markets, minus some exceptions. For advertisers, Custom Audiences allow you to remarket to your existing customers. From here, you’re able to create customised messages for each customer segment, so this could include audiences such as high lifetime value customers or loyalty members etc. 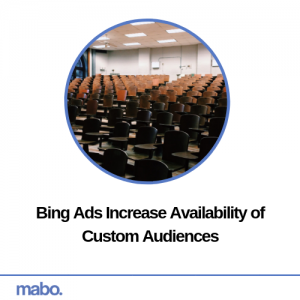 If you would like to make the most of this feature, as soon as you enable the integration, your Custom Audiences will appear in audiences under ‘Shared Library’ in Bing Ads. It’s then from here that you’ll be able to allocate Custom Audiences at the ad group level as target and bid, bid only or as an exclusion.